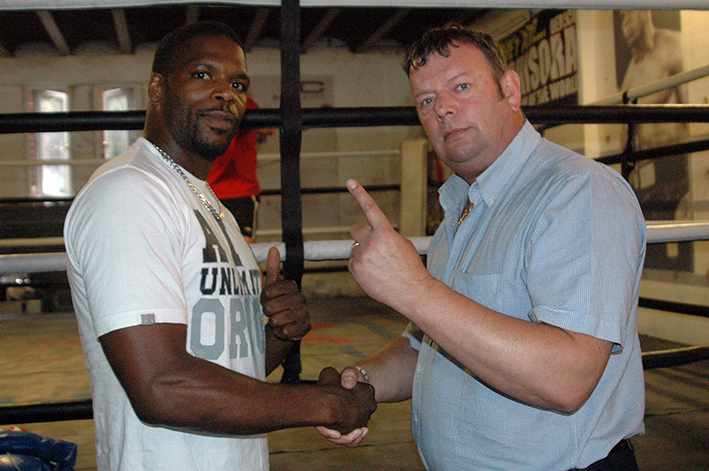 Former WBO Inter-Continental Light Heavyweight Champion, and World title challenger, Mark Prince is set to make a comeback, on the Dave Murphy Acourtier Events promoted ‘NIGHT OF CHAMPIONS’ at York Hall, in London, on Friday 4th October. Mark had a stellar career the first time around, which culminated in a World title challenge against Poland’s Dariusz Michalczewski, who was making his fifteenth defense of his WBO crown. Mark made short work of his first pro opponent, Birmingham’s Bobby Mack, by stopping him in the second round. Neither of his next two opponents, John Kaighin and Art Stacey, faired much better, Mark stopped Kaighin in the third and knocked out Stacey in the second. His fourth opponent, Simon McDougall, did manage to go the distance but it was to be eight bouts later before another opponent, American Lenzie Morgan, was to go the distance with the big puncher. Five month’s later Newcastle’s John Pierre also went the distance, but was the last to do so for almost two years. Manchester’s Maurice ‘Hard’ Core lasted seven rounds, Leeds based Welshman Michael Gale lasted six rounds before Mark hit the Championship trail, with a bang. On the 11th September 1997 Mark faced American Bruce Rumbolz, for the WBO Inter-Continental title. Once again Mark made short work of things, stopping Rumbolz after just one minute and fifty one seconds of the third round. In December Mark made his first defense, against Chicago’s USA’s Wayne Hankins, of his newly acquired title, Hankin’s faired only slightly better than Rumbolz, well lasted forty two seconds longer. A non-championship twelve rounder, against American Kenny Whack, followed as part of Mark’s preparation for a shot at the aforementioned Michalczewski’s WBO World crown. Mark came through a tough full distance test by Whack, winning the bout by good points margins on each of the judges scorecards. On the 19th September 1998 Mark faced Michalczewski at the Arena Oberhausen in Germany. It was a cracking very close all action bout, that was until with just ten seconds to go in the eighth round Michalczewski landed a peach of a left hook to send Mark down and out. Two months later Mark returned to action, against Kevin Mitchell – no not that Kevin Mitchell, but Greenwich’s Cruiserweight variety – who Mark dispatched in just forty three seconds of the first round. Mark retired from the sport shortly after with a 19 win (15 by way of KO) and just the single loss. A few years later Mark’s life changed dramatically, following the murder of his son Kiyan, a prodigious young footballer who played for Queens Park Rangers. On the 18th May 2006 Kiyan intervened in an altercation between between two boys outside the London Academy in Enfield, one of those involved stabbed Kiyan through the heart. This personal tragedy spurred Mark, after the initial disbelief and grieving, to create the Kiyan Prince Foundation, a not-for-profit organization that is committed to using Kiyan's legacy to combat knife crime and other forms of youth violence. Since creating the Kiyan Prince Foundation Mark has dedicated his life to educating youngsters and campaigning for legislation on the carrying of knives.Mark was instrumental, along with then Mayor of London Ken Livingstone, in the lobbying for knife crime to be introduced into the Violent Crime Reduction act that went before Parliament and received Royal assent in November 2006. Mark’s planned return to the ring is directly related to his ceaseless work with young people, to increase awareness and address the consequences of gun and knife crime through education, as he made clear when he spoke earlier. “I’m back right in the mix. One day at a time, I’m up for it, it doesn’t matter who it is I can take care of myself, I have the experience, I’m a World class fighter and that never leaves you. I’ve had twenty fights, won nineteen, fifteen by knockout, so my record speaks for itself. I’m here at MyGym getting ready for the fight, I’ve been sparring Wadi (Prizefighter Cruiserweight Champion Wadi Camacho) and I’ve got a lot more sparring coming this week. Jason Matthews is bringing in a guy, some Russian Cruiserweight or Heavyweight, I’m not too sure. I’m training myself, but so that anyone reading doesn’t get it twisted, it’s the same whether someone’s training me or not. I motivate people, to be able to do that you need to motivate yourself first. I motivate myself, if you look at pictures of before and after you’ll see what condition I’m in.If you see me sparring with Nathan Cleverly at the beginning of the year and if you see how I spar now, the contrast is there, the difference from putting in the work shows. I can’t wait, the British Board didn’t give me an opportunity, that’s really sad, I feel sorry that they couldn’t see the promise and what kind of future I bring by keeping Boxing in a positive light, they wanted to deny me the opportunity to earn money and highlight the cause I’m fighting for, Dave Murphy did and I give him all the praise for that, he’ll be rewarded for the opportunity he has given me. I’m dedicated and to my opponent, whoever he is, don’t mess with this guy, I can’t be squashed and cowed, I survived my son being killed, as well as dealt with the whole grieving process and I’m still here, so if you think that you can break my spirit in the ring, think again as I’m going to take you out. “This is for my beautiful son, Kiyan, who was taken from me and his Mum Tracy, on the 18th May 2006, right outside a school by trying to create peace, by stopping two guys fighting and one of the guys stabbed him in the heart. Because of this tragedy I set up the Kiyan Prince Foundation - www.kiyan.org - It’s a non-profit organization that is committed to work fromKiyan’s legacy, by combating knife crime and other forms of youth violence. It’s simple really, you can’t silence a voice, a powerful voice, I’mnot speaking for myself but speaking for the youth, speaking for the community by highlighting important issues. Young people are dying, not enough is being done, the Government aren’t pulling their weight and I want to get people to open their eyes and young people to rise up and say no to violence on the streets. The youngsters in the inner city are not all bad, they’re not all in gangs. I want to help them and build an organization, a place, that can help young people to equip their mind and equip their body so they can live their live in a positive and constructive manner in their community. That way they can really represent their community in a positive way, not the way they are at the moment, by ‘repping their endz’, you now when another guy from another endz comes into their endz and they stab him or attack him. No, they should be representing their endz with goodness, kindness and positiveness and then they can be putting their endz on the map. I’ve been using boxing in such a positive light and just using it to get young people of the street, the same way it helped me. It not only keeps them busy, gives them discipline, gets them to understand the real meanings of life and prepares them to deal with life. That also helps me to overcome the struggles of life, not just go back into taking drugs , like I used to when I was young. Actually it makes you more resilient, It’s helped me to be more positive and make something of my life. 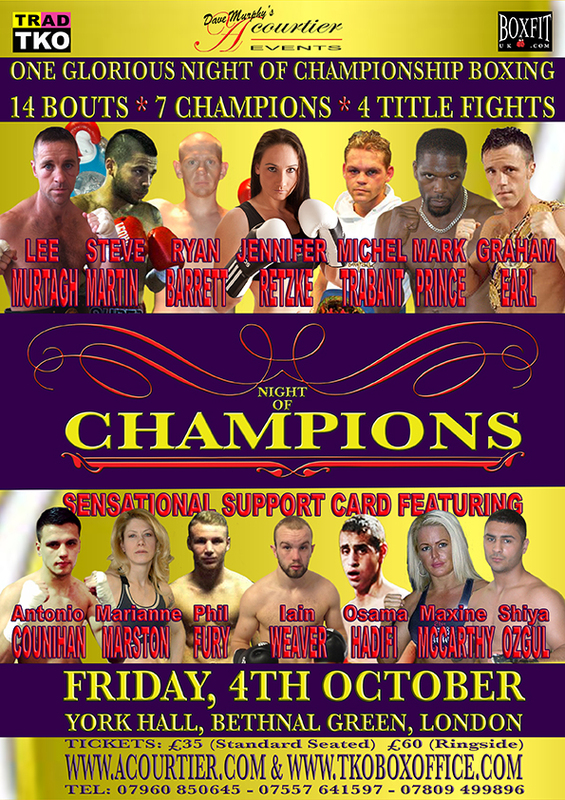 Mark Prince, against a yet to be named opponent, with feature on the undercard of the double World Title headed Dave Murphy’sAcourtier Events, promoted ‘NIGHT OF CHAMPIONS’ event, which takes place at York Hall in Bethnal Green, London, on Friday 4th October 2013. Go online to www.Acourtier.com for additional information on the NIGHT OF CHAMPIONS event or the Acourtier stable of boxers. Follow Acourtier Events on Twitter @AcourtierEvents - friend us at Facebook.com/AcourtierEvents - and on LinkedIn: www.linkedin.com/company/acourtier-events.